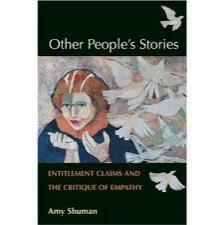 Amy Shuman is a Professor in the English department specializing in folklore, narrative, and critical theory. She is author of books and articles on conversational narrative, literacy, political asylum, disability, food customs, feminist theory and critical theory. 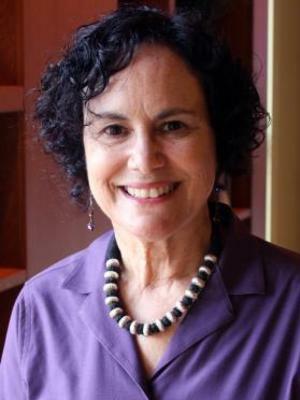 Shuman is a Guggenheim Fellow, the recipient of the 2007 College of Humanities Exemplary Faculty Award, the recipient of the 2014 Distinguished Service Award, and the recipient of the 2015 Distinguished Scholar Award. She served as Director of the Center for Folklore Studies (1995-2005) and also served as Director of Disability Studies (1995-2005). She is currently Director of the Diversity and Identity Studies Collective and is a Fellow of the Mershon Center for International Security. 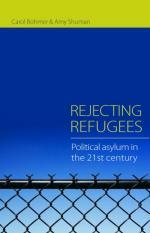 Shuman is author of Storytelling Rights: The Uses of Oral and Written Texts by Urban Adolescents; Other People's Stories: Entitlement Claims and the Critique of Empathy; and (with Carol Bohmer) Rejecting Refugees: Political Asylum in the 21st Century. 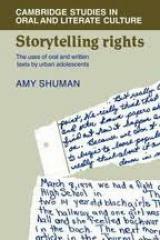 Dr. Shuman is the co-coordinator of the Human Rights Working Group sponsored by the Humanities Institute.